Another outstanding archive live recording brought to you from the Garden Of Delights label. Pretty much as a must-have as the Guru Guru - 'Don't Call Us, We Call You' CD reissue - the 2-CD expanded pressing that I covered in Aural Innovations, issue no. 39. The show took place on November 4, 1972 at the assembly hall in Wiesbaden, Germany. Crowd of maybe 300 was notably in attendance. Three lengthy tracks, like most early Guru Guru live performances. First, there's "Oxymoron" (28:32) which is a well played opener but after eight minutes, the band goes into another song - cannot say for sure which tune of theirs it is, but it's more it the bluesy progressive vein - still brilliant - rest assure that. Next, it's the awesome "Baby Cake Walk" (23:50) which is a true 'classic' Guru Guru trip out and the final cut is "Ooga Booga" (22:05) - a long time Guru Guru standard, that to this very day, I believe that group founder Mani Neumeier and the current line-up still plays while out on tour. It comes accompanied with a 30 page CD booklet packed with plenty of band info, artwork and an exclusive story about the trio during the time of this recording - written both in English and German. Guitarist Ax Genrich talks about how original bassist Uli Trepte (R. I. P.) had left the band due to dramatic circumstances. That they both got beat up by gang members after the last gig that Trepte played with them. 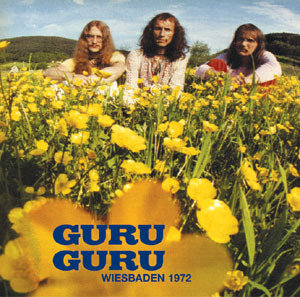 Soon thereafter, Guru Guru got a new bass player that might have lost the band some fans when Trepte had exited but gained more younger followers at the same time. Line-up: Mani Neumeier - drums & vocals, Ax Genrich - guitar & vocals and Bruno Schaab - bass. In my humble opinion, this more recent live Guru Guru title belongs right beside your copies of 'Live & Unreleased', '30 Jahre Live' and especially 'Essen 1970' (also on the Garden Of Delights label). Sound quality is 9.5 - taken directly from the master tapes. Excuse me, as I want to play this CD again.